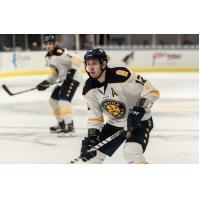 NORFOLK, VA - Ben Duffy scored a hat trick as the Norfolk Admirals edged the Jacksonville Icemen Friday Night at Scope. Ty Reichenbach made 31 saves for Norfolk, winning his 21stgame of the year. With the win, Norfolk sits eight points back of the fourth and final playoff spot in the South Division. Jacksonville jumped out front early with a goal from Wacey Rabbit. The Admirals were unable to clear the puck out of the Norfolk zone which led to a chance for Jacksonville. Cody Fowlie was able to keep the puck in the Norfolk zone at the blue line. Fowlie fed the puck to Wacey Rabbit in the slot who was able to fire a slap-shot past the glove of Ty Reichenbach to give Jacksonville a 1-0 lead at 3:11 of the first period. Norfolk tied the game with a goal from Brant Sherwood. Mitch Hall gathered the puck from along the wall and fed Domenic Alberga at the edge of the Norfolk zone on the left side. Alberga then stretched a pass to Sherwood who skated in on Christian Frey on the left side. Sherwood cut across the ice, waited out the goaltender, and roofed the shot over the outstretched glove of Frey to tie the game at one goal apiece at 7:30 of the first period. The Admirals took the lead on a goal from Ben Duffy. Connor Hurley cleared the puck out of the Norfolk zone and led a rush the other way for Norfolk which was a two-on-one. Horn received the pass in the right circle and then found Duffy in the left circle for a one-timer which went right past the glove of Frey to give Norfolk a 2-1 lead at 17:17 of the first period. Norfolk extended its lead with another goal from Ben Duffy. Jake Wood sprung the Admirals into the Jacksonville end on an odd man rush. Duffy gathered the puck and had it knocked away in the slot. Duffy then regained control in the right circle and fired a backhand shot over the glove of Frey to give Norfolk a 3-1 lead at 10:27 of the second period. The Admirals extended their lead to three goals with a goal from Alex Rodriguez. Rodriguez dumped the puck into the left corner and went to battle for it along the boards. The puck came free and ricocheted right into the crease where Rodriguez poked the puck past Frey to give Norfolk a 4-1 lead. Jacksonville would add a late goal with a tally from Dajon Mingo. Jake Randolph dumped the puck into the right corner. Kris Newbury dug it out and played into the slot for Mingo. An Admirals player fell in-front of the net which allowed Mingo to be open. Mingo found the puck in the faceoff dot and fired a wrister that beat Reichenbach to cut the Norfolk lead to 4-3. Duffy added a late empty-net goal for the hat trick and Norfolk won by a 5-3 final score. Ty Reichenbach was strong as he made 31 saves on 24 shots and to win his 21st game of the year, while Christian Frey made 17 saves on 21 shots to take the loss for Jacksonville. The Admirals close out the weekend tomorrow night against the Icemen for St. Hatricks/ Mental Heath Awareness Night presented by NAMI Coastal Virginia and The Dirty Buffalo. Doors open at 6:00 p.m. and puck drops at 7:00 p.m.